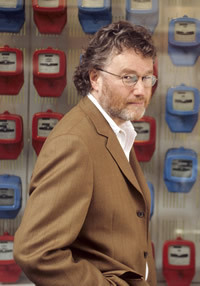 We are incredibly sad to report that our beloved author, Iain Banks, died on Sunday, 9th June, following his cancer diagnosis in March. It has been Orbit’s great privilege to publish all of Iain’s SF works. Over the course of 25 years since the publication of CONSIDER PHLEBAS, we have been dazzled, entertained, heart-broken, inspired, exhilarated and – on a number of occasions – horrified, by the stories, characters (human and otherwise) and words that he has shared with us. As a person, and a writer, Iain’s generosity was boundless; his imagination spectacular; his intelligence piercing; and his spirit irresistible. The science fiction genre has lost one of its greatest and most original voices and we have lost one of our heroes. We will miss Iain enormously, and we extend our deepest sympathies to his family and friends.